If you don't mind your beaches backed by glittering high rises with a touch of Vegas sparkle, then The Gold Coast is for you. The best places to stay on The Gold Coast range in style in a similar way to the beach towns themselves. The glitziest are closest to the fun mecca of Surfers Paradise and the more stylish, boutique options radiating south into the lush green hills behind the coast. There are 35 long, flat, golden beaches along this stretch of sunny coast, offering some of the best surfing in Australia. Some of them, like those around Surfers Paradise, are backed by bars, clubs, cafes, hotels and theme parks, while those towards the southern end have more laid-back charm and significantly fewer parking maids in gold bikinis. Behind the Gold Coast's perfect stretches of sand is a subtropical band of national parks, dotted with waterfalls, mountains and viewpoints with spectacular views of the surrounding countryside. So while most people are here for the beaches, there's actually a lot behind them. Lamington National Park is famous for rainforests huddling in deep valleys, ripe for exploring, while the Springbrook National Park covers an ancient volcano. If you're here for the surfing, this is a great place to learn as well as being ideal for experienced surfers. There are surf schools up and down the coast willing to teach you or just rent you some gear. Several big surf competitions are held here annually, so you might even catch the pros at work. Surfers Paradise has become one of the biggest party towns in Australia, with thousands of visitors descending daily into the theme parks, malls and then the restaurants, bars and clubs. But it's not all like this, if you want wildlife sanctuaries and peaceful sand you'll still find it, you just have to head south. 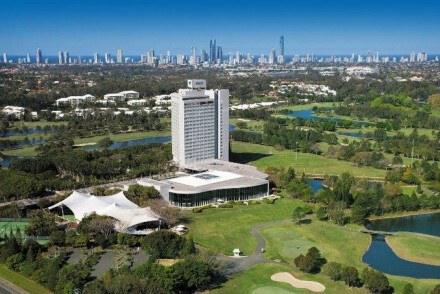 Our pick of the best places to stay in the Gold Coast range from the great value to the truly OTT! What could be more chic than a hotel designed by Italian fashion house Versace? 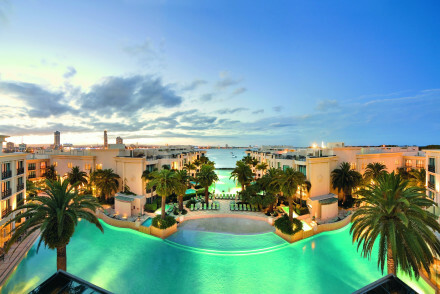 The Palazzo Versace offers just that in the Main Beach area. 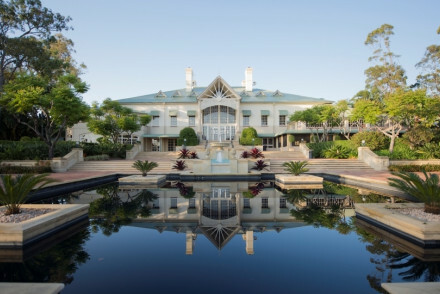 This luxurious hotel has decor from the Versace home collection, a private marina, huge rooms and Australia's only water salon. 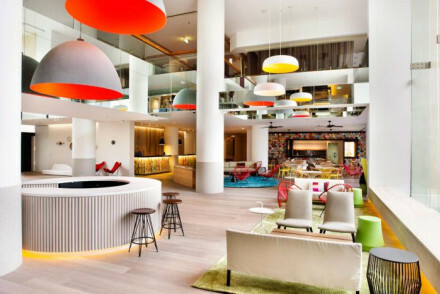 QT Gold Coast is a jazzy hotel in Surfers Paradise where the decor is vibrant and retro. The sea-facing rooms have great ocean views - you're just a stone's throw from the beach - and the rooms on the other side of the hotel face the mountains. Prices start from just over £100 per night. 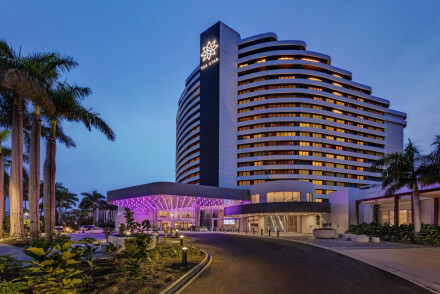 The Sheraton Mirage Gold Coast is, surprisingly, the Gold Coast's only five star hotel. A spacious, stylish retreat right on the beach with sea views and a great seafood buffet. Back from the beach, surrounded by greenery, you'll find Peppers Ruffles Lodge and Spa, a luxurious collection of suites and villas offering magnificent views over the ocean and Tambourine Mountain. 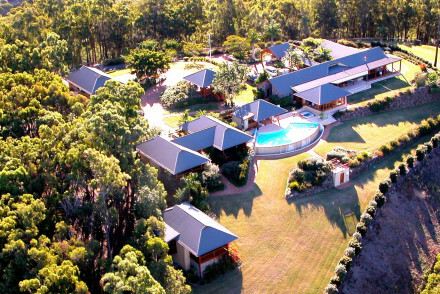 There's an infinity pool, luxurious spa and several acres of garden to relax in. Book the Royal Pines Resort if you prefer golf to surfing. Here you'll find a golf course and driving range, plus a range of other facilities including gym, spa and tennis courts. 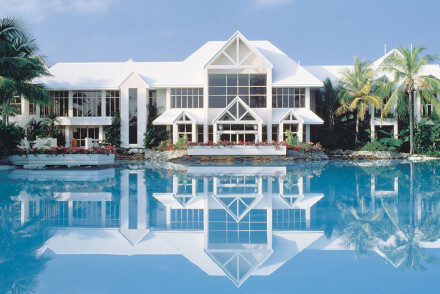 Another good pick for golfers is the Intercontinental Sanctuary Cove. Again there's a course on site, plus lagoon style pool, four restaurants and spa. The Gold Coast has an airport, the Gold Coast Airport, at the southern end of the about 25kms outside Surfers Paradise. However Brisbane Airport is larger and connected to a greater number of international destinations. If you want to hire a car - which we highly recommend if you’re staying on the Gold Coast and you want to see more of Queensland - we recommend you visit our online partner Rentalcars. People love to visit the Gold Coast during the summer, but it’s really, really hot and humid, and it can be quite rainy. If you prefer warm, sunny weather over sky-rocketing temperatures then the best time to visit is between April and May, which is also outside of the school holidays so relatively inexpensive. Expand your search to include the best places to stay in Brisbane?